You can add new pledges through Pledges → Add New Pledge in the WordPress Administration Panel. Unlike other post types, pledges do not contain most of the same options as standard posts. They support only a few specific fields. Pledge Options are found below the title on the Edit Pledge page. If the Pledge Options are not visible, make sure they are checked inside the Screen Options area at the top. If you are adding a new pledge, make sure you have saved the post before editing pledge options. Otherwise, the pledge options will not be visible. Select the cause this pledge will be attributed to from the causes dropdown. The total of pledges to this cause will be displayed alongside the cause. 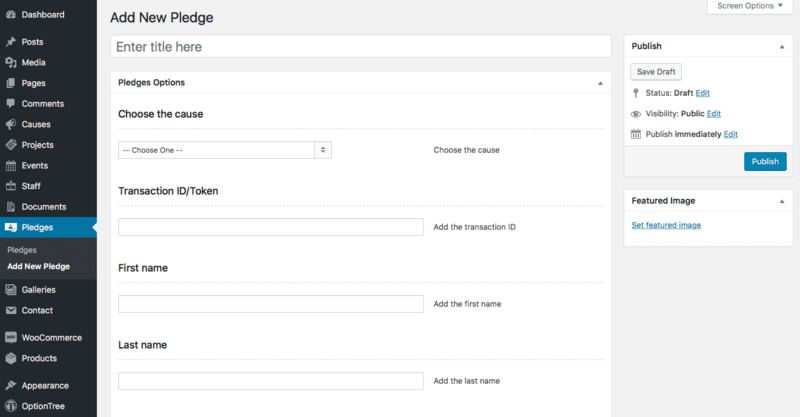 This is the pledge transaction ID. Use a PayPal reference as the transaction ID if the pledge is made using PayPal, or anything else otherwise. The first name of the person making the pledge. The last name of the person making the pledge. The address of the person making the pledge. The email address of the person making the pledge. The amount the person has pledged, in the currency selected in Appearance → Theme Options → Payment settings → Currency Code. Do not enter a currency code in this field, just a number. The source of the donation – either PayPal, cash/check or manual. Whether the payment has been successfully completed and the money has been collected by your organisation. Can be set to either Completed, Refunded or Cancelled.